Can you believe there’s only 25 days until Christmas?!?! I CAN’T WAIT!!! Have you started your shopping yet? Are you an early shopper or do you wait until Christmas Eve to start shopping? I like to get my shopping done early, but Adam is 100% last minute. It stresses me out, but he hasn’t dropped the ball on a present yet, so I can’t complain. If, like me, you already have Christmas presents on the brain and are looking for ideas, I highly recommend gifting a subscription box. There’s seriously a subscription box for every interest. Plus it’s the gift that keeps on giving! 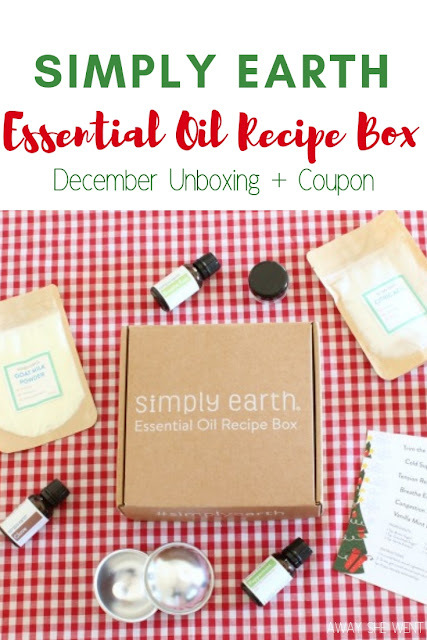 The Essential Oil Recipe Box from Simply Earth would be a great gift for anyone looking to learn more about essential oils or trying to live a more natural, chemical-free life. 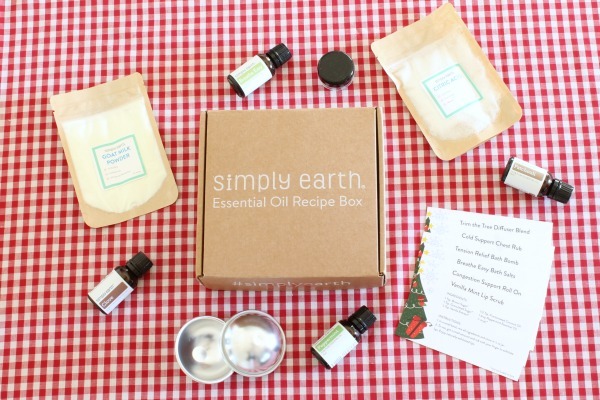 The Essential Oil Recipe Box from Simply Earth is a monthly subscription box that contains 4 essential oils, 5-7 recipe cards, and most of the supplies needed to make the recipes. Each month’s box is a fun, new theme (this month’s theme is obviously Christmas). All of the oils are 100% pure therapeutic grade with no added chemicals or bases. Disclaimer: I received the December Essential Oil Recipe Box from Simply Earth in exchange for this post. All thoughts and opinions are my own. This post also contains some affiliate links. I receive a small percentage of the purchase price at no additional cost to you. The essential oils in the December box are Peppermint, Clove, Patchouli, and Breathe Easy. 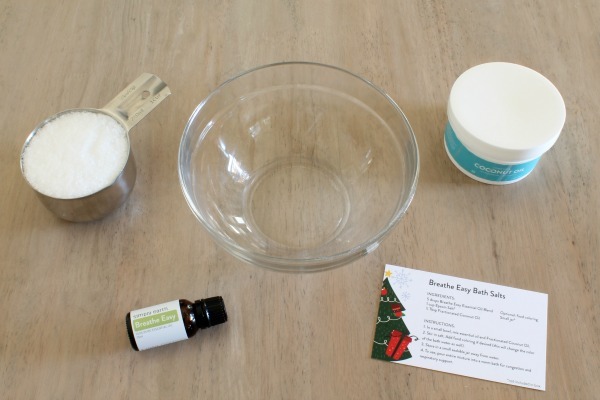 The recipes for the month are Vanilla Mint Lip Scrub, Congestion Support Roll On, Tension Relief Bath Bomb, Cold Support Chest Rub, Trim the Tree Diffuser Blend, and Breathe Easy Bath Salts. The box even includes the citric acid, goat milk powder, and the mold for the bath bomb recipe! I’m honestly not a big fan of patchouli so I probably won’t use it much, but the Breathe Easy blend completely makes up for it. I’ve been SO stuffed up for the past few weeks. I wake up at least once a night to blow my nose…I’m sure it’s starting to drive Adam insane. So the first recipe I tried was the Breathe Easy Bath Salts. There’s only 3 ingredients so it’s super easy to make. You’ll need the Breathe Easy Essential Oil Blend from the box, plus Epsom salt (not included) and fractionated coconut oil (included in the Big Bonus Box – see below for coupon code to get it for free!). Mix together and add to a warm bath. My sinuses and lungs felt so much more open after soaking with these bath salts! I have a feeling I’m going to be taking a lot of baths this winter. 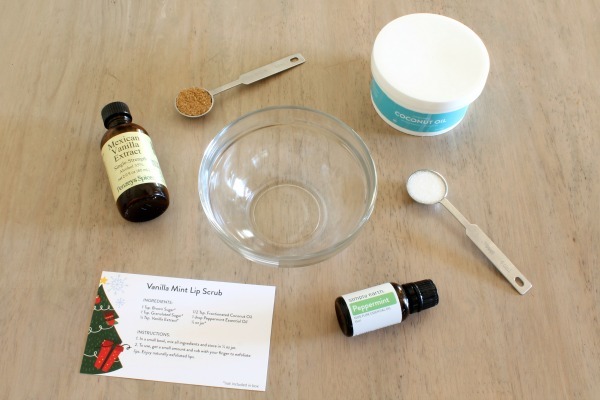 Another fun recipe is the Vanilla Mint Lip Scrub! I was so excited to see this recipe in the box because I almost bought a lip scrub a couple weeks ago! My skin and lips have been so dry since the weather started cooling down, so I’ve been looking for something to help. I’ve only used the scrub a couple times, but it seems like it’s making a difference in the flakiness! 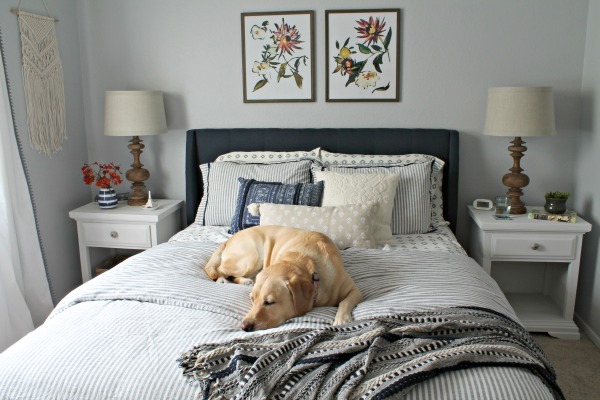 This would also be such a fun DIY Christmas gift too! You could make a big batch and package them up in cute little jars to give out! 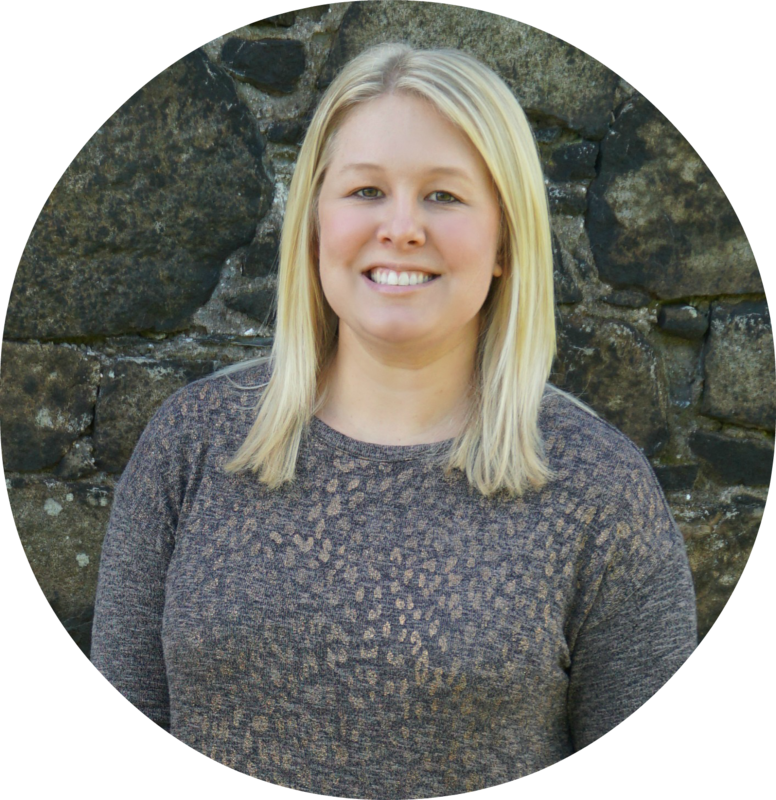 This box is such a fun way to learn more about essential oils if you’re a beginner like me. All of the different oils and recipes can get overwhelming on your own, but this box makes it easy and manageable. As I’ve mentioned before, I also love what Simply Earth stands for. They sell direct to customers at fair and honest prices without any MLM schemes. They also donate 13% of their profits to help end human trafficking. 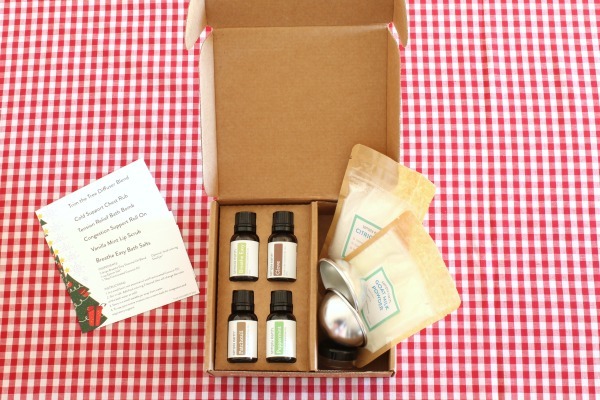 If you’re interested in trying the Essential Oil Recipe Box for yourself or gifting a subscription, it’s $39/month and shipping is free! Use the code AWAYSHEWENTFREE to receive a Big Bonus Box and a $20 gift card to use on a future purchase! The gift card can even be used on your next box! Click here to subscribe! Oh my gosh! This box seems so great! I think we are going to need to subscribe to this box! You should! It's so fun and such a great way to start going chemical-free!